Maracas Bay Hotel Trinidad- What to do in Trinidad? Trinidad is one of the two islands which make up the Republic of Trinidad and Tobago, the two most southernly located islands of the Caribbean. Carnival Monday and Tuesday are celebrated on different dates each year from January to March. The calypso competitions and the Carnival steelband and Queens' and Kings' competitions start weeks before Carnival. Maracas Bay Hotel is only 30 minutes away from Port of Spain where all the main activities take place. Caroni Bird Sanctuary- Tours into the Caroni Bird Sanctuary are by boat with a guide. See the white egrets and the scarlet ibis ( Trinidad's national bird) come home to roost on different trees for the night. Wild Fowl Trust, Pointe a Pierre . Take a guided tour around the park. 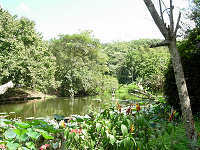 This includes a lake with exotic flowers, including beautiful lotus flowers and water lilies. Visit Trinidad's famous ever-replenishing Pitch Lake. Our asphalt is exported for road surfacing all over the world. Pitch lake tours, arranged from the office at the lake,cost about TT 30.00. Call 648-7697 for tour information. Play golf at Trinidad's famous golf club and enjoy the lush tropical flora and fauna. This Golf course is 20 minutes away from the Maracas Bay Hotel. 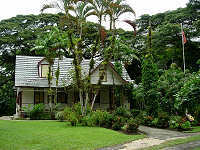 Mount St Benedict Church and Monastery - Bird watching and nature trails. There is a tearoom where you can order tea and lunch.